​You may be wondering where is that BHS t-shirt I bought at the 45th? Even if you found it, it probably doesn't fit. Do yourself a favor and pop for some new garb to celebrate the 50-Year Reunion. 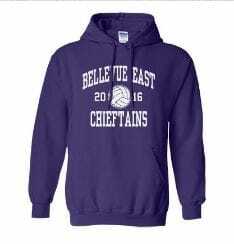 The following are links to vendors that sell Bellevue East High School apparel. Apparently you can customize their standard designs to delete the "East." We have no experience with, nor do we endorse, any particular vendor. If you have a particularily good (or bad) experience, share with your classmates on the Reunion Facebook page.